the humerus joins several other bones. 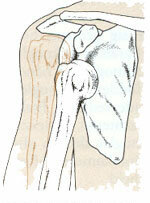 A real joint is defined by having a joint capsule, which surrounds a joint cavity between bone ends. Movement is possible between the bones in a real joint. The bone ends, the joint surfaces, have a natural position in the neutral position and from that position move within certain limits. If these limits are exceeded dislocation or luxation of the joint might occur. It can be a so called subluxation where the joint shifts but slips back into the original position or an outright dislocation/luxation. Some joints without joint cavity and joint capsule might also dislocate as for example the spinal joints. Luxation occurs mainly in connection with accidents where the joint is forced beyond its natural movement limit. This leads to tendon rupture and the affected joint is pushed unnaturally apart and dislocates. This results in an abnormal joint position and eliminates the joint function. Damage to the joint capsule, joint cartilage, muscles, blood vessels and/or nerves will result and there might also be fractures. In congenital hip luxation, there is an increased risk of later luxations in the same joint. Genetic disposition for lax joint capsules (hyper-mobility) and poor connective tissue can lead to increased incidence of luxations. - Arthritis can also result in dislocations. In luxation the joint capsule is destroyed. It can heal with scar tissue but this tissue is weaker that the original tissue. There is also a risk that the capsule will be more lax than before. This gives an increased risk of another luxation in the same joint. In severe cases a so-called habitual luxation situation might arise where very little impact will lead the joint to dislocate. This is mostly seen in jaw and shoulder joints. Intense pain that arises from the breach of the joint capsule and/or damage of other tissue and malposition of the joint. At the same time, lesion of a nerve can reduce tactile sense and/or muscular strength in the affected area. Joint cartilage damage may result in a so-called mouse in the joint and the joint might lock. A blood vessel lesion will result in internal bleeding. Broken bones (fractures) and muscle damage may cause symptoms such as pain and disability. Muscle exercise and strengthening is very important for persons with a tendency for luxation in one or more joints. Moreover, situations pushing the joint to its limits should be avoided as this might result in luxation. You may need to give up certain sports, but other sports such as swimming and cycling may be beneficial for training the muscles. In joints, where it is possible (for example fingers) it might be useful to support the joints by a bandage or taping in connection with sport activity. A dislocated joint must be put back in place as soon as possible. It is important not to try to deal with this oneself as this might inflict further damage to tissue and the bone especially if there is also a fracture involved. One should seek immediate medical or emergency room assistance. It is important not to eat or drink as the repositioning and other treatment might involve a full anesthetic where it is important that the stomach is empty. The diagnosis is typically very simple based on the pattern of strong pain, reduced joint function and visible joint malposition. In most cases an X-ray is taken to verify the dislocation and to exclude occurrence of a fracture. Treatment must be carried out by a doctor. Patients with frequent luxations are often able to put the joint back in place. But even in these cases, one should visit the emergency room to have an X-ray taken to determine whether there is any damage in connection with the luxation. Depending on joint is affected the doctor will choose an adequate anesthesia. In large joints such as hip and shoulder joints it may be necessary to put the patient in full anesthetic to relax the big muscles around the joint. Finger joint luxations can be treated with only local anesthetic, where each finger is anesthetized. After repositioning the joint is immobilized by a sling, bandage or plaster. The immobilization much not last too long – max. 3 weeks – not to risk limitations to the joint movement. The next step is rehabilitation for example in consultation with a physiotherapist. Proper rehabilitation is very important to regain full mobility and to prevent of repeated luxations. Some luxations can be so serious that it requires surgery to bring joint surfaces back into place. In patients with tendency to repeated luxations an operation where the ligaments and joint capsule are tightened might be necessary. Lesions to nerves, blood vessels or bone will often require immediate surgery. In luxations there is a risk of habitual luxation recurrence where even a very small impact will lead the joint to dislocate. This can be debilitating and each episode might be very painful. Luxation involving spinal joints might lead to damage to the spinal cord resulting in paralysis. (see damage to the spinal cord). Damage to nerves of arms or legs might arise in shoulder - respectively - hip luxations. The final stage after a luxation is often osteoarthritis (artrose). It may take many years before this condition develops. In simple, non complicated, dislocations followed by proper rehabilitation a full recovery is often possible.